In 1960, The First Church of Christ in New Haven, CT was restored to its original early nineteenth-century architectural style. 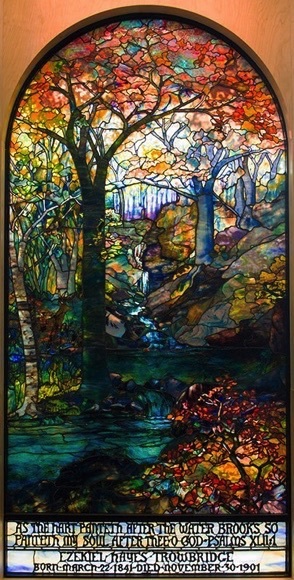 They donated this large Tiffany landscape window to the Southern Connecticut State University, where it was installed in a large light box in the campus library, along with two other plated opalescent windows. In 2008, the University began the renovation and large addition to their library with plans to build a glass wall where these beautiful windows could be installed and viewed in natural light. 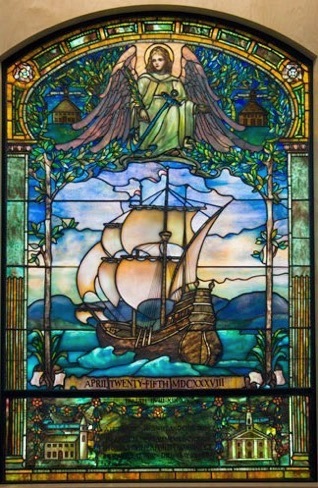 This landscape window titled “The Water Brooks Window”, in memory of Ezekiel Hayes Trowbridge, measures 54” wide x 98” high, (not including the bottom memorial inscription panel which measures 11” in height), is a single panel fabricated entirely with copper foil and no support bars, but with an intricate, thorough application of brass fins on the exterior. 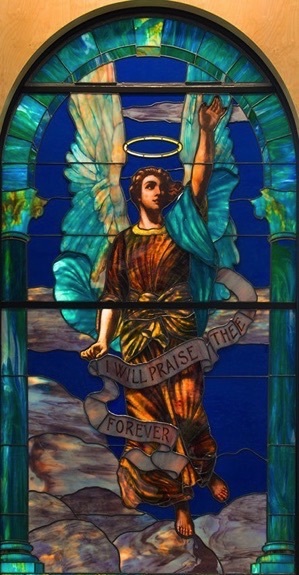 In September of 2008, our studio was awarded the contract to repair and conserve all of the opalescent windows for the Buley Library. The University’s Project Manager and his team, were aware of the importance of these windows and their historic value. Their goal was to select a studio with sufficient understanding and knowledge of minimally invasive procedures and a philosophy of intervention only where absolutely necessary. We are very proud to have been selected to conserve these beautiful windows and look forward to the challenge. 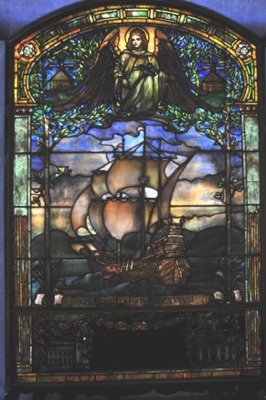 This stunning Tiffany window titled “The Hector” designed and fabricated in 1898 is the second Tiffany window from The First Church of Christ in New Haven, CT also being restored and conserved by our studio for the Southern Connecticut State University Library. The Hector was the ship which brought the early colonist to New Haven, CT in 1638. In the corners of the window are depicted the congregation’s four meeting houses dated 1640, 1670, 1757 and 1814. Up to five layers of glass are found in some areas of this window. Construction of the new library building was delayed, and in March of 2015 the windows were finally reinstalled in their new location in front of a large glass wall, allowing the windows to be lit with natural light as originally intended.